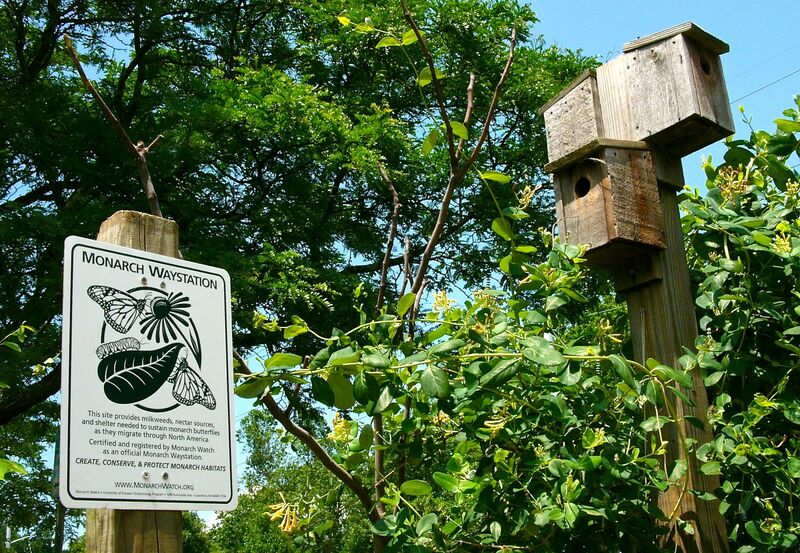 The Bluemont Bird and Butterfly Garden began around 2004. The space, which had been just another parking lot island, was filled with various flowering perennials and shrubs and was used and maintained by park rangers. When the county changed its policies regarding ranger assignments, no rangers were permanently assigned to the park and it fell into disrepair. In 2013, a team of four interns and a Master Gardener were tasked with revitalizing the garden. Work began in December of 2013 to assess and plan for the project. When the project began, the park looked like an overgrown dirt patch. The walkways were indiscernible and overgrown plants were crowding each other out of the garden. Since then the team, with the help of dedicated community members and support from Parks and Recreation staff, has transformed the park into a once again flourishing garden. Click here to see the transformation! Lonicera sempervirens thrives near the new sign certifying the Bluemont Park Bird and Butterfly Garden as a Monarch Waystation. The garden has been planned with a range of plants to bloom from spring to late fall and also has varieties like Winterberry and Beautyberry to provide winter interest.The season began with the early blooming serviceberry tree whose fruit has since ripened, much to the delight of the resident birds. The Amsonia hubrichtii and Lonicera sempervirens ‘John Clayton’ bloomed in early May adding vibrant blue and golden yellow hues to the garden. Since the end of May, the Penstemon digitalis has been attracting bees and butterflies – with the Verbena bonariensis and Hydrangea quercifolia adding to the blooms in late May and the Asclepias tuberosaand Yucca soon to follow. 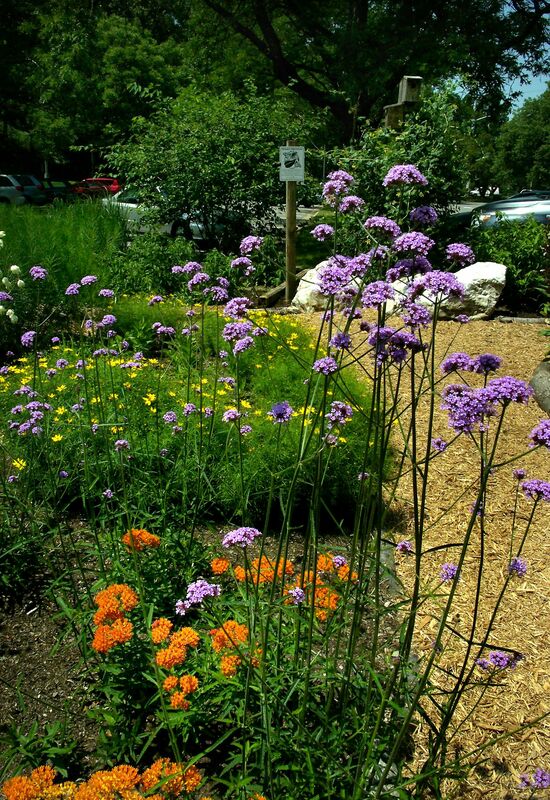 Asclepias tuberosa, Verbena bonariensis and Coreopsis bloom in the Garden in mid-June. This entry was posted in Demonstration Gardens, MG in the Garden, Pollinators and tagged Amsonia hubrichtii, Asclepias tuberosa, Beautyberry, Bluemont Bird and Butterfly Garden, hoary mountain mint, Lonicera sempervirens, Master Gardener, Monarch Waystation, Monarch Waystation Certification from Monarch Watch, National Pollinator Week, Parks and Recreation, plant of the year, pollinator week, pollinators, purple coneflower, serviceberry tree, Verbena bonariensis, Virginia Native Plant Society, Winterberry. Bookmark the permalink.